Speyside Craigellachie Distillery, now owned by Dewar’s, has revamped their single malt range. I had the opportunity to taste the four bottlings. Interesting, they all bear the same distinctive mark: a robust, meaty character imparted by traditional worm tub condensers. 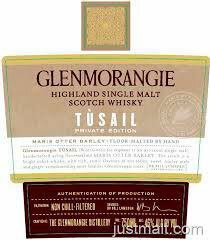 Another new release, Tusail, is a new addition to Glenmorangie Private Edition Collection. The four editions are not chill filtered, bottled at 46%, with no artificial colour. They all matured in traditional hogsheads. The 13 Year Old has been finished for six months in PX casks. The nose is intense, fruity and meaty. Lots of toffee and butterscotch. Sweet and dusty. A toasted coffee beans note. The palate is robust, with a raw silk feel. The finish is dry and nutty with a ginger character. The same fruity/spicy character. Great balance between nose and palate. Satin like texture. Gingerbread, dried pears, a hint of pastrami. The finish is intense and spicy. Sweet almond aftertaste. This version is found in travel retail only. Very unusual aromatic profile. It is like entering a painter’s studio. Malty with an oily feel. Beewax, linseed oil. Meaty again. With a farm-like character, straw, cow’s breath. Water brings out sweetness and a peppery note. Citrussy. Lime, grapefruit. Polished old floor. Hint of liquorice. The palate is crisp and bold. Toffee, that same meat note. Oak is more present than in the other versions. Still this muscular structure. A lingering finish with a gingery character. This new bottling comes as the sixth release of the Private Edition Collection. Last year’s was Companta. Each year, the emphasis is put on a special character. Tùsail (meaning originary in gaelic) features a particular winter barley variety, Maris Otter which is said to have a deep flavour. Created in the 60’s, this barley was popular in the brewing industry. But it went out of fashion 15 years later as the industry was looking for higher yields. It was at risk of extinction, which was a concern for the craft-brewing companies. Two English seed merchants decided to rejuvenate Maris Otter and from 1992, build up the stocks. Tùsail has no age statement. It is not chill filtered. The nose is intensely malty and sweet. Treacle. Sticky toffee pudding. Old leather. A luscious floral character. Marshmallow. Meadowsweet flower. Very perfumy. A hint of marmalade. The texture is satin like. Sweet barley sugar. A touch of smoked applewood. Ginger and cinnamon. The finish is spicy. Less sweet on the palate than on the nose. A rich full bodied whisky.